It has an extremely high cure rate. No other treatment modality can guarantee complete removal of the tumour to as high a degree of certainty. This greatly reduces the chances of any subsequent recurrence of the tumour. This technique ensures that an absolute minimal amount of normal tissue is sacrificed. This is of immense importance around the eyes. This also ensures that the reconstructive surgery required to deal with the ensuing defect is less extensive. Conversely, the technique ensures that difficult tumours with poorly defined margins in difficult areas are not underestimated in their extent and depth and are cleared completely. Why is it necessary to travel to another hospital in Manchester for this treatment? The Mohs surgeons for this region are Dr. Nick Telfer, Dr. Vindy Ghura, and Dr Vishal Madan. They are Consultant Dermatological Surgeons based at the Dermatology Department of Salford Royal NHS Foundation Trust, Salford. They are among very few doctors in this country who have received specialist training in Mohs micrographic surgery. Their role in your management is to remove the tumour. Once this has been done you will transfer to the Face & Eye Clinic Manchester where you will undergo surgery for the reconstruction of the defect left by the Mohs surgery. This will normally take place the same day under “twilight anaesthesia“. What happens before your reconstructive surgery? You will visit the clinic to have a preoperative consultation with your oculoplastic surgeon. This usually lasts 40 minutes. You will be asked to complete a healthcare questionnaire before seeing me, providing information about your current and past health, about any previous eye, eyelid or facial surgery or treatments including refractive surgery or laser eye surgery. I need to know if you have a past history of any eye problems e.g. 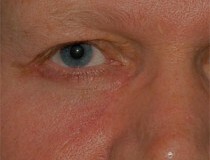 dry eyes, or if you use contact lenses. I need to know about any allergies you may have, medications you are taking (including over the counter products e.g. Aspirin, Indomethacin, Nurofen, Diclofenac or vitamin supplements), previous major surgery or illnesses, and any past dermatology history. Please answer all questions completely and honestly as they are asked only for your own wellbeing, so that your reconstructive surgery can be planned as carefully as possible. The information is treated confidentially. If you are unsure of the names of any medications, bring them with you. You will be told whether or not to stop any medications at this preoperative clinic visit. For example, if you are taking aspirin-containing medicines or anticoagulants, they may need to be temporarily withdrawn or reduced in dose for two weeks before the procedure as long as these are not medically essential. You might need to check this with your GP. Any anti-inflammatory medicines e.g. Ibuprofen, Nurofen must be discontinued at least 2 weeks before surgery unless they have been prescribed for a specific heath problem. (Check this with your G.P.). These medicines predispose you to excessive bleeding. Your blood pressure should also be under good control if you take medications for hypertension. This is very important. Your vision in each eye is measured. Your eyes are examined carefully using a slit lamp (a special ophthalmic microscope). Your tear film status is determined and the back of the eyes (called the retina) is examined as well as the eyelids themselves. The rest of your face is then examined. The general state of your skin is assessed and photographs of your face and eyelids are taken before surgery so that the results of surgery can be compared with the original appearance. The photographs are confidential and can only be used for any purpose other than your own records with your specific written permission. What will the Mohs Micrographic Surgeon do? He will inform you of when and where your Mohs surgery will take place. This procedure is performed under a local anaesthetic and the removal of the tumour takes place in stages. There is a waiting period between each stage of approximately 1 hour during which time you will be resting in a waiting area, with a temporary bandage in place. Do not eat or drink anything from 8.00 a.m. (at least 6 hours before your planned reconstructive surgery at the Face & Eye Clinic, Northenden, Manchester where your reconstructive surgery will be performed under local anaesthesia with intravenous sedation by an anaesthetist – “twilight anaesthesia“). You may have a drink of water up to 2 hours before the reconstructive surgery but nothing else. The procedure may take anything from 1 hour to most of the morning to perform, and once the procedure has been completed you will transfer to the Face & Eye Clinic, Northenden, Manchester. What will happen when I arrive at the Face & Eye Clinic? You will be seen by the nursing staff initially. The surgical wound will be carefully examined by your surgeon to determine precisely what type of reconstructive surgery will be required. This will be discussed with you. This will usually be performed under a local anaesthestic in the operating theatre. If you wish, the anaesthetist who will be monitoring you during the surgery will give you some sedation to help you relax (“twilight anaesthesia”). Very occasionally, if the defect is very large, this surgery will be performed under general anaesthesia at a local private hospital instead. This will be discussed with you. Admission to hospital is not necessary if local anaesthesia with or without sedation is required but if admission to hospital is required because you live some distance away, or you live alone, or because you would prefer to, please bring an overnight bag so that you are prepared to stay with us if necessary. 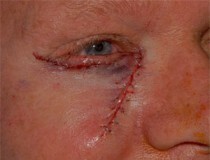 What will happen following the surgery at the Face & Eye Clinic? You will be discharged home within an hour of the completion of the surgery. Pressure dressings over the eye along with a bandage around the head may be kept in place for a few days and arrangements will be made for you to attend the clinic a few days to a week later for the dressings to be removed by the nurses. 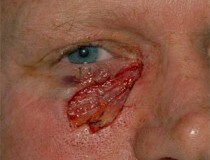 You will then attend again a week later for your sutures to be removed. Unless you have been told otherwise please do not use aspirin or any aspirin containing medications for at least 2 weeks prior to the surgery. This may include a number of arthritis medications e.g Nurofen, Voltarol, Brufen, & Indomethacin. If in doubt please ask. Please Note:If you are insured it is important that you clarify in advance with your insurance company the level of reimbursement they will allow for this surgery. Unfortunately, some insurance companies grossly under-estimate the expertise and time required for this type of treatment and leave patients with a shortfall. We will be happy to provide your insurance company with details of your proposed treatment along with a quote for the costs. To learn more about Mohs Micrographic Surgery, please contact us at today to schedule an appointment.